Having viewed the trailer (over and over), for which Mr. Stead also composed the music, I so wanted to fall in love with this story. I laughed out loud over the item bartered for, enjoyed the clever ways the animals participate in this cumulative tale, but overall I didn't connect as much as I'd hoped. That said, the art is some of the best I've seen. Brilliant, vibrant, detailed, and whimsical, it demonstrates the creator's passion for all things nautical. All in all, I loved this story enough to gift it to a Jonathan who entered the world last week. May Mr. Stead produce more amazing art, and soon. 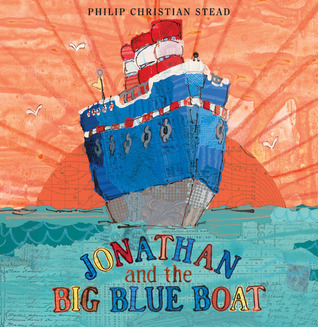 Sign into Goodreads to see if any of your friends have read Jonathan and the Big Blue Boat.